Monthly giving is so vital to the Love For Life (LFL) efforts – helping us do MORE for the dogs in our care! Below are frequently asked questions and answers that may be of interest to you about our Love For Life Program and how you can help. Q: What is the Love For Life Program? 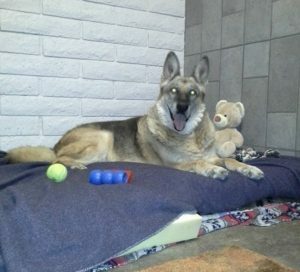 A: Love For Life (LFL) recognizes there are senior dogs or dogs with special needs and/or illnesses that will remain with them for the rest of their lives and prevent them from being considered “adoptable.” These special-needs dogs would likely be euthanized, had they not been rescued by Saving Paws. To enable LFL to support these dogs, the Love for Life Program was created within Saving Paws Rescue AZ to support the financial needs of these dogs for the remainder of their lives. 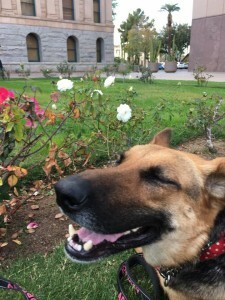 Dogs in LFL are often overlooked for adoption as their medical or behavioral conditions and the costs associated with them discourage potential adopters. LFL aims to place as many of these dogs as possible in understanding forever foster homes so the dogs can live out their lives in a loving home environment. Dogs not placed in a foster home can still live out their lives within the sanctuary of the rescue center cared for each day by loving volunteers. A: Sponsorship is a donor’s personal commitment to make monthly contributions to the Love For Life Program. Our Sponsor Program helps care for special-needs dogs (hospice, senior, medical and behavioral) who will need ongoing support from LFL for the remainder of their lives. Q: Why should I become a Sponsor? A: Love For Life does not believe that being sick, old or afraid should be a death sentence in a shelter. We make a commitment to all the dogs, including those dogs who would be forgotten elsewhere. We recognize adopting a special needs dog may be financially overwhelming, so the Love For Life forever foster homes provide the best quality of life possible while the costs falls to the rescue. Donations made to the Love for Life Program are specifically allocated for the care of the dogs in the Program. Donations do not fund the general adoption program or rescue operations. Q: What do I receive when I become a Love For Life Sponsor? A: With your monthly sponsorship, you will receive a personalized certificate of your support of LFL, a Donor Plaque in the Remembrance Garden (Caretaker level and above), and acknowledgement of your sponsorship on our webpage or social media sites. Most of all you get the reward of knowing your support helps a dog others have given up on so they may live out the remainder of their life cared for and loved. If you prefer your sponsorship to be kept confidential, LFL respects your request for privacy and will not acknowledge your sponsorship in any of our publications, website, social media forums or Garden. Q: As a Love For Life Sponsor, are there different levels of sponsorship that I can reach? Q: As a Love For Life Sponsor, may I cancel my monthly giving whenever I want to? A: Love For Life is grateful for any and all support, but should you need to cancel your monthly giving we will discontinue your sponsorship immediately upon request. You may call us at (480) 737-6089 or send an email to sprlove4life@gmail.com. Q: Can I support the Sponsor Program without making a monthly pledge? A: Yes, you can! We understand monthly giving is not the right fit for every donor, and we appreciate any support you would like to give to Love For Life. Every single donation makes a difference to a dog. In-kind donations are another way for supporters to assist the Love For Life Program. LFL will put out a “needs wish list” from time-to-time on our website or social media outlets asking for specific things needed to help the foster parents provide for a dog in their home. Additionally, individual “wish lists” will be published on our website. Needs may include items such as a ramp to assist a senior dog get in and out of the car or an elevated bowl for a medical dog that cannot lean down to eat. A: You can make your monthly pledge in the way that is most convenient to you – by Check/Cash, or Paypal subscription. Please contact LFL to make arrangements to deliver your donation to our rescue center – (480) 737-6089. To download a copy of these FAQs, click here. Learn more about this program and view available Love For Life dogs on the Love For Life Program page.